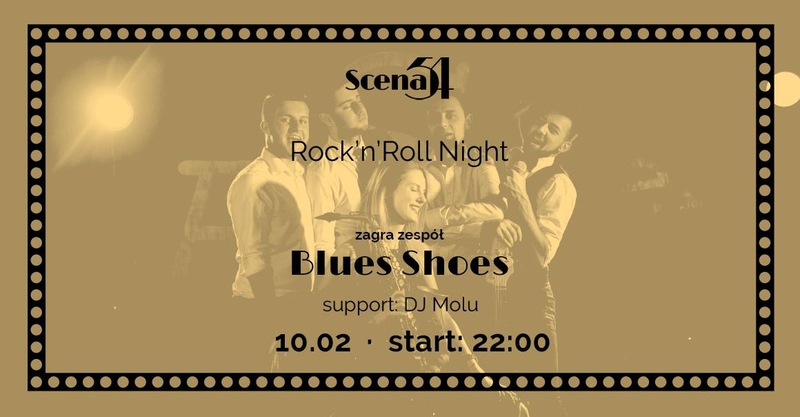 On 10th February (Saturday) Scena54, at 10/2 Dolne Młynów will be full of real rock'n'roll energy thanks to Blues Shoes concert! This is a real treat for fans of crazy concerts referring to the best rock'n'roll tradition. The band's repertoire is a truly explosive mix of everything that's best in this musical genre. Staying true to the musical tradition of the 1960s, they can breathe the spirit of freshness into a traditional rock'n'roll repertoire and with amazing energy, so infect the audience that it is immediately kidnapped to dance! presents both well-chosen repertoire, full of the best and most well-known covers, as well as excellent, professional performance combined with great contact with the audience. Come to Scene54 on Saturday 10.02, let me move into the crazy 1960s and check out the real rock'n'roll in the new version!